A science-fiction sandbox game that takes place in a procedurally generated universe. The story is set in the 24th century, when Earth struggles with overpopulation, climate change, and natural resource depletion. 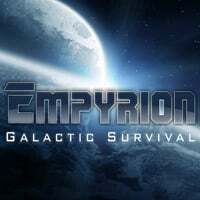 Empyrion: Galactic Survival for PC is an open world space survival game that combines the elements from many genres into one huge science-fiction sandbox. It was developed by Eleon Game Studios, a developer team founded by experienced space games enthusiasts who desired to create a game that they always wanted to play. The story is set in the 24th century, when Earth struggles with overpopulation, climate change, and natural resources depletion which leads to political instability as well as numerous rebellions and wars. At the same time, in Antarctica, an alien ship powered by an unknown energy source was discovered, and a map of a galaxy located 2.5 million light years from Earth was found on board. This discovery allowed humanity to dispatch a powerful space expedition. The player assumes command of one of the starships being part of the mission, however, as a result of a failure, the vessel crashes down on an uncharted planet, and the protagonist, a sole survivor, is forced to fight for survival. Empyrion: Galactic Survival has all the features that a well-done science-fiction sandbox should have. The key aspect of the gameplay, though, is the survival. In the game, we visit various kinds of planets. On each of them, there are dangers that we should be vary of, including adverse weather conditions as well as different, and usually hostile, kinds of aliens. We have to be ready for anything, making sure we always have an adequate supply or air, food, and drink. These basic resources can be obtained in a number of ways, such as killing animals, growing plants, or utilizing what we've managed to find. Unique plants also allow us to prepare medications, which are equally vital to survival. The procedurally generated game world consists of a myriad of planets and asteroids, so, having learned the basics and leaving the first planet, there is a lot of exploration to be done, both in the vast space and on the surface on various heavenly bodies. This is why construction is an important aspect of the gameplay. In the game, we can erect numerous kinds of objects from scratch, starting with spaceships to complex star bases. Empyrion also offers an advanced crafting system, thanks to which we can create useful tools and unique weapons. The available planets can be explored either using ship or on foot, should the environmental conditions allow it. What has to be remembered is that combat is inevitable: we will fight hostile aliens and wildlife both in space as well as on the surface. As far as visuals are concerned, Empyrion: Galactic Survival for PC presents average quality level. The game is powered by the Unity engine. In accordance to the genre’s standards, we can play either alone or with our friends. The production allows us to join forces with other players and face all adversities cooperatively or try out the extensive PvP system that lets us fight other players. Expectations: 9.1 / 10 calculated out of 58 players' votes.